Thirty years ago, I was dazzled by my action-packed month visiting a friend and his family in Japan. They live in Fukui Prefecture near the Sea of Japan, but I gazed in wonder at the Gion Festival and temples in Kyoto, kabuki theater in Tokyo, the deer park in Nara and Himeji castle from shogun days. The most delicate and intimate thing I recall was a tea ceremony performed by a friend of my friend at her home. Garbed in a kimono, our host greeted us and led us to her tea area where a small shrine, with incense and blossoms, dedicated to her ancestors, stood in a prominent spot. She went through ritual preparations and whisked the powdered green tea with hot water in special bowls, then presented them to us to admire. We turned the bowls three times to appreciate the decorations inside each bowl before we drank the frothy tea. At the end of the ceremony, our host presented me with a fine tea bowl painted with fall leaves and gold leaf to take home with me. It’s been keeping me company ever since as a treasured objet d’art and memento of my trip. Before I left Japan, I purchased a bamboo whisk and a tin of special powdered green tea with the thought of trying my hand at preparing the tea once I got home. I’ve kept them with my kitchen spices above my stove for thirty years, admiring the Japanese letters, waiting for that perfect moment when I would perform my own tea ceremony and savor the tea. Somehow, the moment never arrived. Maybe I was too busy with life and the years somehow passed. I often looked at my whisk and tea and enjoyed the anticipation, the possibility of someday re-creating the tea ceremony. 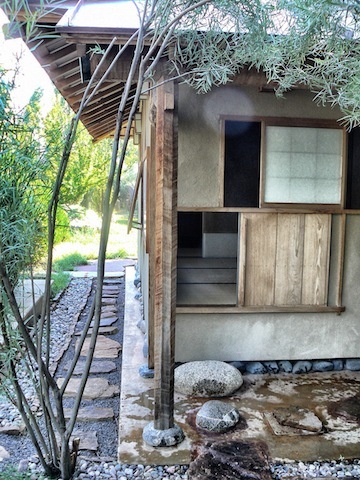 Recently, tea came back into my life when my friends Rick and Edith took me with them to a tea ceremony held at Sunrise Springs, an inn and spa about twenty minutes south of Santa Fe, New Mexico. We were asked to wear comfortable clothing and white socks and to remove or leave home our jewelry and watches, as they could damage the delicate tea bowls. We arrived at the appointed time and waited in the garden near a koi pond with the other two participants. The assistant to the ceremony leader alerted us when they were ready and, one by one, we knelt by a stone water basin and used a bamboo dipper full of water to rinse our hands and cleanse our faces. After the cleansing ritual, we followed the stone path to the teahouse, crawled through the entrance (it was like a big window) and sat on the floor around the edge of the room. The tea ceremony host, Tonia, and her assistant wore solid colored kimonos with obis - long silk pieces - wrapping their waists. During the detailed ritual, they came in and out of the main ceremony room by kneeling on or rising off the tatami mats and sliding the paper door behind them. Both women have been to Japan many times and are avid students of the tea ceremony. The other two participants are also studying tea. Tonia pointed out a painted scroll and basket containing a flower for us to admire. We learned that these decorations, and the teas and cups, change with the seasons. Tonia also explained how the coals to heat the water were made. Then she ceremonially prepared each bowl with powdered green tea and hot water, whisked the mixture so the tea became frothy, and gave a bowl to each of us in turn. We were given dainty sweets to take before we drank the tea - to cut the bitterness - and haiku poems that suited the theme of the day. We read our haikus to the others after we nibbled and sipped. After the tea ceremony, Edith showed us all a quilt she created after a recent trip she and Rick made to the island of Shikoku in Japan. They completed a pilgrimage of 88 temples, and, at each one, the monks stamped their pilgrimage books in red ink with the symbol of that temple and wrote in calligraphy to prove they stopped there. Edith scanned all 88 pages, then transferred them to fabric and created her quilt, which she finished off with sashiko, a special Japanese style of embroidery. What? Six months? This really is a case of use it or lose it! The joke’s on me, but I’m consoling myself with a date to join Edith and Tonia for another tea to honor the new season. I’ll watch Tonia carefully and I’m determined to find another tin of green tea and finally whisk up my own bowl of the taste of Japan.